Flying (to) the Coop for the new menu! 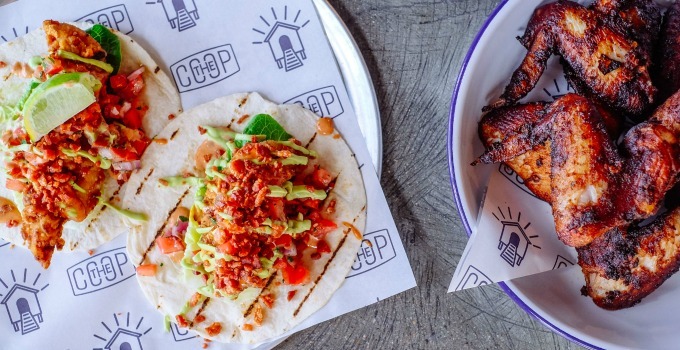 Tasty as cluck and renowned for its finger lickin’ good chicken, the Coop Bistro is rustling feathers with its summer menu. Whether you’re partial to poultry or more inclined to the veg life, they’ve got a meal and a deal for any preference. Feeling snack happy? You’d be tarred and feathered for not ordering the chicken kaarage. Dusted in their own special spice blend it’ll give The Colonel a run for his money. Want to really spice things up? The BLAT tacos prove that the only way to make chicken tacos better is by adding bacon, and the sweet potato fries with rosemary salt and their special bulldog hot sauce will certainly kick start the taste buds. Risk of feeling hangry? Order up big my friends, our pick is a toss up between the chicken schnitty with rocket salad, a parmi with slaw or a signature chicken burger (with pickled pawpaw and nori mayo, or blue cheese and chipotle BBQ!) Chicken not your cup of KFC? Prepare to obsess over the garlic mushroom tacos (so good that it’ll even convert the staunchest carnivore) or the sensational summer harvest burger with avocado herb mayo and a quinoa, beetroot and sweet potato pattie. Looking to inhale a dessert? Forget chocolate and get fruity with the pimms and lemonade jelly, complete with sorbet and cucumber – perfect for a humid AF Brisbane evening. Grab your flock and fly down to The Coop Bistro to try their latest summer menu. By Kat Gridley – the gourmand who’s 2018 resolution is to try every kind of fried chicken in Brisbane.